The RIDGID<sup></sup> AM2265 Compact Air Mover is a versatile tool that is perfect for professionals, and DIYers who want high volume air movement to tackle a variety of tasks. This compact blower fan offers 3 speeds with an average of 600 CFM (cubic feet per minute) of airflow on the highest speed setting that is dispersed quickly over a large area. This air mover can be used to quickly dry a variety of wet surfaces such as floors, carpets or rugs, paints or stains, and drywall mud. The integrated power outlets allow you to daisy-chain up to three AM2265 Air Movers together, eliminating the need for extension cords when drying large areas. The power outlets can also be used to connect appliances, tools, and other devices requiring power; up to an 8.9 Amp max outlet rating. This Air Mover can also help ventilate workspaces, creating a cooler and cleaner working environment. The stackable design allows you to easily stack up to three units for storage or transport. Integrated Power Outlets allow you to create a Daisy-Chain with up to three RIDGID<sup>®</sup> Air Movers, eliminating the need for an extension cord. Compact, lightweight design is very portable, and easy to store. 3 operating positions for drying floors, walls, and ceilings. 10 ft. (3 m) power cord provides long reach and wraps conveniently around carry handle for storage. Vertically stackable up to 3 units high for easy storage, and transporting of multiple units. Full Lifetime Warranty against material defects and workmanship. To obtain the benefit of this warranty call 1-800-4-RIDGID (1-800-474-3443). For water damage restoration professionals who need air movers that can squeeze into hard-to-reach spaces, the Flex FX-1 Mini from B-Air offers a lightweight, affordable solution. This air mover, available in blue and other colors, is perfect for air moving under counters, in closets and attics, inside drop ceiling panels and other tight spots. Weighing in at just 12 lbs., the Flex FX-1 Mini can fit into these small spaces, but it still delivers powerful performance, helping to effectively move air and reduce moisture inside these small areas. The Flex FX-1 Mini is versatile, too, able to be positioned at 3 different angles - horizontal, vertical and 450. Choose to set up your Flex FX-1 Mini to best meet your air moving needs. The Flex FX-1 Mini is designed for water damage restoration professionals who operate in rugged commercial and industrial environments. Constructed of high-quality, durable materials, the Flex FX-1 Mini comes to work each day and works just as hard as you do. An adjustable tilt angle frame on the 20-inch High-Velocity Floor Fan helps get the air flowing where you need it with a 3600 tilt range. This high-powered fan offers quiet operation at each of its three speeds, while a rotary switch allows for easy control over the airflow. Rail-style legs provide support no matter what angle the fan is pointing, making it suitable for just about any room or job site. The new RIDGID GEN5X 18-Volt Hybrid Fan is like nothing the work place has ever seen or heard, before. Featuring the new Covert Air Technology this fan is the quietest and most powerful fan on the market. This fan is hybrid, so it can run off 18-Volt HYPER Lithium-Ion batteries or plugged in for endless power. The GEN5X 18-Volt Hybrid Fan pushes out 475 CFM making it have best-in-class air flow. With a 240 rotation and over 10 different hanging options, this fan can cool down the work place wherever it is. The Aerodynamic Turbo-Aire High Velocity Fan is the world's first and only aerodynamic laminar flow household fan. It's whisper quiet on all three speeds and is energy efficient. It uses less energy than a 100W light bulb and delivers 100% more air than conventionally designed fans. 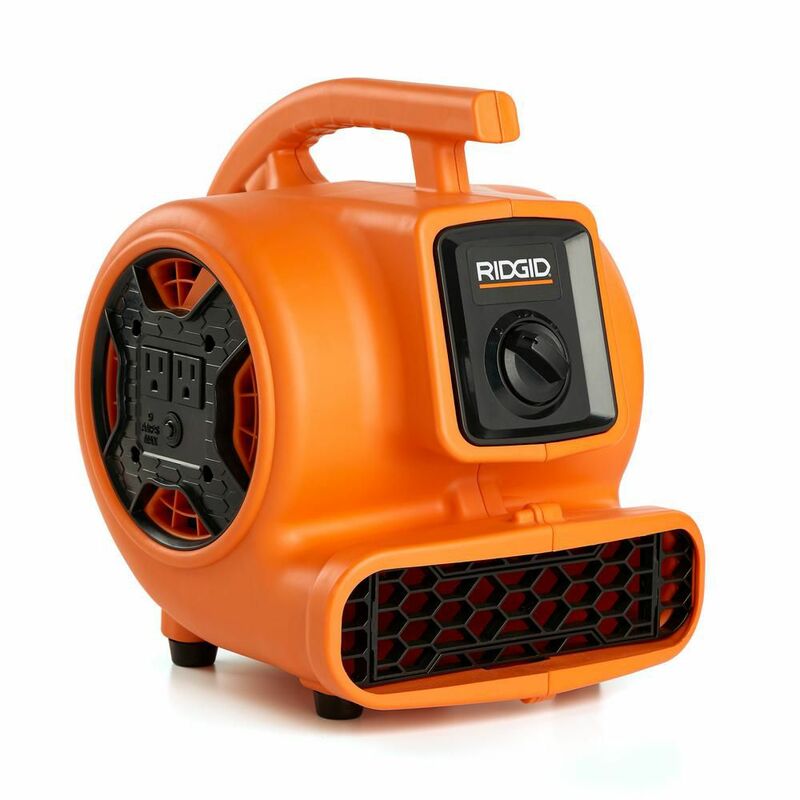 Air Mover 600 CFM Portable Floor Dryer & Blower Fan With Power Outlets For Daisy Chain The RIDGID<sup></sup> AM2265 Compact Air Mover is a versatile tool that is perfect for professionals, and DIYers who want high volume air movement to tackle a variety of tasks. This compact blower fan offers 3 speeds with an average of 600 CFM (cubic feet per minute) of airflow on the highest speed setting that is dispersed quickly over a large area. This air mover can be used to quickly dry a variety of wet surfaces such as floors, carpets or rugs, paints or stains, and drywall mud. The integrated power outlets allow you to daisy-chain up to three AM2265 Air Movers together, eliminating the need for extension cords when drying large areas. The power outlets can also be used to connect appliances, tools, and other devices requiring power; up to an 8.9 Amp max outlet rating. This Air Mover can also help ventilate workspaces, creating a cooler and cleaner working environment. The stackable design allows you to easily stack up to three units for storage or transport. Air Mover 600 CFM Portable Floor Dryer & Blower Fan With Power Outlets For Daisy Chain is rated 4.6 out of 5 by 85. Rated 4 out of 5 by Kevin from The selection in stock was limited to just the RIGID... The selection in stock was limited to just the RIGID 600 CFM . It does perform well, and we needed one right away to dry our downstairs carpet. Rated 5 out of 5 by BeauxTX1 from Tiny but VERY powerful. It's been a nice addition to... Tiny but VERY powerful. It's been a nice addition to my shop. Rated 5 out of 5 by Josh from My review is actually for the AM22650 which is almost identical to this blower and is rated at 65... My review is actually for the AM22650 which is almost identical to this blower and is rated at 650cfm. This blower must have taken the place of the one I bought last fall. I paid $99 for mine and that was the regular price. I had an undiscovered plumbing leak under a house that left about a foot deep of red clay which you could have used to make brick. I had to wallow in the mire the best part of a day to replace all the horizontal copper runs with pex, and then had to throw away my clothes. Thank goodness for Shark Bites to join the old to the new. The mineral content in the water had formed miniature weep holes in the very bottom of the copper and it very quietly and almost unnoticeably sprayed under the house for who knows how long--weeks or months, maybe. Having fixed the leaks I had to dry out the underneath of the house. I went to HD and bought the Ridgid AM22650, set it up under the house blowing across the huge mud pit. Emergency contained, I promptly forgot all about the blower under that house for some three or four MONTHS. When I finally remembered that I had left it under there running, I went over to the house, prepared to find the thing locked up or on fire, but it was humming along just like the day I put it under the house. It was running quietly and smoothly just like the day I bought it. It had run CONTINUOUSLY for MONTHS right off the shelf. I've used it many times since, and it still runs like a champ. There was another brand there that was blue and $10 cheaper. I debated whether to spend the extra $10. I'm glad I did. Rated 5 out of 5 by Anonymous from Haven't needed to use it yet but with a lifetime... Haven't needed to use it yet but with a lifetime warranty who can complain?